Mix until blended together JUST until incorporated. Add to pie plate, fluent the edges by pinch between your fingers. In a saucepan stir together the flour, cornstarch, sugar and salt. Add boiling water and cook until mixture boils and thickens, 3-5 minutes. Temper the egg yolks slowly with some of the mixture and add back to saucepan. Cook 2 more minutes and remove from heat. Immediately add butter, whisking until melted. Add zest and juice, blending until smooth. Slowly add sugar until dissolved. Add cream of tartar and vanilla, blending well. 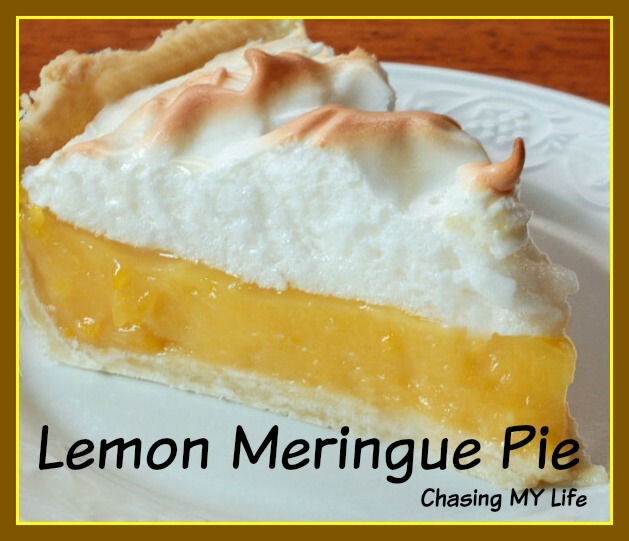 Add meringue to pie, sealing to crust. Bake 12-15 minutes until meringue is browned. Cool completely and then chill. Meringue is extremely humidity sensitive. The sugar in the delicate mixture readily absorbs moisture from the air, which makes it soft and nearly impossible to achieve thick, stiff peaks. Humidity may also cause soft meringues to weep or crisp meringues to soften once baked. Using a copper bowl and beaters that were in the freezer for 30 minutes helps. Many chefs prefer to use use copper bowls, a reaction between the copper and egg whites tends to produce a fluffy, more stable foam. Just before using a copper bowl, clean it with salt and lemon juice or vinegar, then rinse with cold water and dry thoroughly before placing in freezer. Also make sure when separating your eggs to be extra careful, even the smallest piece of yolk can ruin your meringue. Separating your eggs while cold is easier to not get bits of yolk into the whites.